I had a couple of Saturday mornings in a row, one assisting at Rioter tryouts and the other trying out for Second Wind, both with 9:30 calls, which really made me realize how acclimated I've become to evening workouts. I mean, I make a big fuss over bout day breakfast, but what is that really, just breakfast when I have a lot of time to make a fancy breakfast, the bout itself is in the evening like all my other practices. And actually, I rediscovered oatmeal for breakfast when we had our December bout at the Armory and had to be there early and all day for setup. What I discovered was, I can't face a bowl of meat, greens, and sweet potato at seven or eight in the morning, and I do need starchy carbs that I can digest and burn for fuel forthwith. Thus this oatmeal! This is the version for when you're in a hurry, with an egg stirred in for added protein, a swirl of carrot puree because I had it on hand and thought it might be good and it totally is, and just a pinstripe of maple syrup because I had that on hand from making marshmallows. And a good splash of almond milk, because that's how I like my oatmeal. I'm winding down with veg purees for the nonce so I will have to save further ideas for next winter, but I think I'd do a savory version of this with cauliflower puree, a tiny bit of minced green onions, and a drizzle of soy sauce, maybe in miso broth. 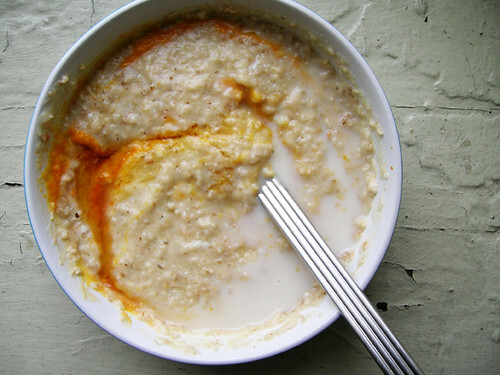 Bring the oatmeal and water to a boil over medium high heat, stirring constantly and adding water as desired, and also heat the carrot puree in your bowl in the microwave, both for about two or three minutes. Off the stove, crack in the egg and whisk it in throughly. I do think it might incorporate more smoothly if I blended it in my rocket blender, but mah, then I have dirtied another dish. So I whisk very vigorously with a whisk and leave it at that. Scrape the oatmeal over the puree in the bowl, swirl to make it fancy, pour in some almond milk and drizzle a little maple syrup on top.